New website works to save Madagascar’s incredible diversity of frogs. To save Madagascar’s embattled and beautiful amphibians, scientists are turning to the web. A new site built by herpetologists, Sahonagasy, is dedicated to gathering and providing information about Madagascar’s unique amphibians in a bid to save them from the growing threat of extinction. The website has been designed to address these issues by providing an open database of scientific studies and even full downloadable books on Madagascar’s amphibians. One of many of Madagascar’s unique frogs, the Heterixalus rutenbergi is classified as Near Threatened by the IUCN Red List. Photo by: Franco Andreone. In addition, the site includes a place where both researchers and amateurs (or even intrepid tourists) can upload photos of amphibians from the field. Photographers can tell researchers where the photo was taken with GPS coordinates or from an interactive map. Herpetologists will even help you identify the species if there is difficulty. “In this way, anyone with a camera (and maybe a GPS) can contribute to the understanding of the distribution of Malagasy amphibians!” adds van der Mejiden and Nieto. In total Vences estimates that Madagascar probably possesses some 450-500 species of amphibians “once all the undescribed species have received scientific names”. While this is a large number of species, Vences says that the real importance of these frogs comes from the fact that every one of them can be found solely on Madagascar: amphibians on the island are 100 percent endemic. A close look at the famed tomato frog Dyscophus antongilii is considered Near Threatened. Photo by: Franco Andreone. But these amphibians face a wide variety of threats including habitat loss, deforestation, climate change, the pet trade, and, amid desperate poverty and political turmoil, an increasing reliance of big frogs for food. Current events, such as illegal logging in Madagascar’s treasured parks, have only worsened the situation for frogs. In spite of all the troubles for Madagascar’s amphibians, there is fortunately one major threat they have avoided so far. Dyscophus guineti is considered Least Concern. Photo by: Franco Andreone. “The lethal chytrid fungus (Batrachochytrium dendrobatidis), present in many parts of the world and cause of incipient extinctions of so many peculiar frog species[…] has not yet been found in Madagascar, and conservationists are really hoping that this pathogen will not arrive in Madagascar,” says Andreone, who adds that travellers and researchers should disinfect their boots when arriving in Madagascar to help ensure the disease isn’t spread. However even if the amphibians of Madagascar avoid the chytrid fungus, they still face many grave threats, not least of which is Madagascar’s uncertain political situation and its citizens’ worsening poverty. Wider awareness around the world and an uptick in funding will be essential if the world is to save not just Madagascar’s hundreds of endemic frogs, but the island’s whole unique ecosystems, which many citizens rely on daily for food, water, and shelter. Mongabay: What does Sahonagasy mean? What is the goal of the website? The lovely and Critically Endangered golden frog (Mantella aurantiaca). Photo by: Franco Andreone. Miguel Vences: ‘Sahonagasy’ is composed of the words ‘sahona’, meaning frog, and ‘gasy’ (short term for Malagasy), and thus meaning ‘Malagasy frog’. By giving the site a name in the local Malagasy language we want to emphasize that this site, and the whole Action Plan for the conservation of Malagasy amphibians (ACSAM), is meant as a community effort that eventually should be lead by Malagasy conservationists and researchers. The political crisis that started in 2009 made our initial plans difficult to develop the website in closer collaboration with our Malagasy colleagues, and we thus began to sketch the outline of the website with a seed grant of the BIOPAT foundation. The goal of the website www.sahonagasy.org is to provide a scientific platform mainly for the conservation of Malagasy amphibians, although this, in the future, can also be extended to reptiles and possibly other animal and plant groups. Many opportunities exist for contributing to amphibian conservation, but the past 20 years have seen resources wasted because of a poor coordination of efforts: many surveys and reports have been produced that were never published, many tourists found and photographed amphibians but these photos were not made available to mapping projects, many studies carried out by Malagasy students did not make use of literature because it was not available which lowered the quality of scientific conclusions. Sahonagasy.org is open to the scientific and conservation community as a platform for communication, repository of data (photographs, locality records, in the future also call recordings or tabulations of data), and data base of resources such as specialized literature. The project will be open to the community for further development and updates, and will only live if the pertinent community will contribute to it. Mongabay: What makes the frogs of Madagascar unique and important? The Critically Endangered Mantella cowanii. Photo by: Franco Andreone. Miguel Vences: There are various aspects. First, there are a large number of species of Malagasy frogs, probably about 450-500 once all the undescribed species have received scientific names. This is a high number, but probably not absolutely outstanding because in other regions of the world new species are continuously being discovered and the numbers of species will continue increasing. However, in Madagascar the density of individuals is amazing: there are few places in the world where so many species and individuals of frogs can be observed in a single night as in some of the centers of species richness within Madagascar. Second, the degree of endemicity (100 percent among native species) is extremely high—all Malagasy frogs occur nowhere else in the world. Third, there seem to be various unique features in the community composition of Malagasy frogs that allow us to know a lot about how ecosystems are organized and diversity arises in the course of evolution. Among these are the high number of tree frogs depositing eggs in streams (in other parts of the world there are usually less tree frogs specializing in running water), and the extremely high density of tadpoles in mid-altitude rainforest streams, possibly linked to the rareness of fish in these streams. Mongabay: Are there some particular standout amphibians on the island? Miguel Vences: Certainly, there are some species that are highly attractive and suitable as flagship species, such as poison frogs in the genus Mantella, the tomato frogs (Dyscophus antongilli and D. guineti), or the amazingly colored Scaphiophryne gottlebei. However, in general rather than highlighting a few unique species, the really extraordinary thing about Madagascar’s frog fauna are their diversity and density. Mongabay: What are some new features on the site? The Critically Endangered rainbow burrowing frog (Scaphiophryne gottlebei) Photo by: Franco Andreone. Arie van der Mejiden and Sandra Nieto: The website now has full downloadable books about Malagasy amphibians and their conservation. The latest field guide to the amphibians and reptiles of Madagascar is available in Malagasy. The book The Threatened Frogs of Madagascar is available in four languages including Malagasy. These high-quality books are freely downloadable in PDF format. There is now a new fully searchable database of (mostly scientific) articles on Malagasy amphibians. This is the largest collection of literature on Malagasy amphibians available on the web, spanning almost 200 years and containing 1669 references. Many of the database records are associated to the PDF file of the original article. Most of the older articles are free of copyright and have been made available for the first time in digital format. People interested in the more recent copyrighted articles can request a username and password to gain access. The latest addition to the site is the photo database, in which both amphibian biologists as well as interested amateurs can upload their images. These photos can then be georeferenced with the GPS coordinates or from an interactive map. If necessary, experts on Madagascar fauna will try to identify the animal on the pictures for you. In this way, anyone with a camera (and maybe a GPS) can contribute to the understanding of the distribution of Malagasy amphibians! 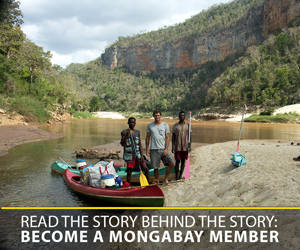 Mongabay: How do you see the website aiding conservation of frogs in Madagascar? 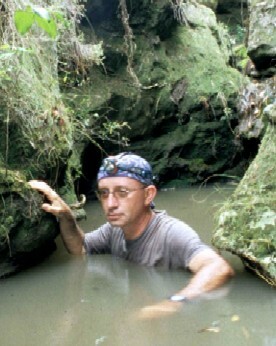 Herpetologist Franco Andreone searching for the Critically Endangered rainbow burrowing frog (Scaphiophryne gottlebei). Photo by: Franco Andreone. Franco Andreone: First, it will contribute to increasing the knowledge and understanding of the amphibians of Madagascar by presenting the most threatened species, the ongoing conservation projects, and by introducing the ACSAM initiative (A Conservation Strategy for the Amphibians of Madagascar) and the Sahonagasy Action Plan, both launched by the Amphibian Specialist Group. Moreover, we would like to address attention to the large number of available PDF papers dealing with amphibians, reptiles and conservation in Madagascar. Clearly, it is very important to provide access to a literature reservoir that, until recently, was almost unavailable for the Malagasy researchers, due to a generalised lack of public libraries in Madagascar. In such a context, web facilities are working to solve this non-negligible aspect, since Malagasy zoologists are the primary actors engaged in nature conservation. Publicity about the status of amphibians and on the current conservation actions are also important aspects to help conservationists and biodiversity researchers find funds for their studies and for conservation actions. Then, the possibility to download original photographs of Malagasy amphibians will provide a tool to build an updated database of findings and observations by tourists visiting Madagascar. This will be an important action to increase the knowledge of Malagasy nature and its conservation. Moreover, the database allows one to geo-reference the photographs and produce an available online species distribution. Mongabay: What is threatening the frogs of Madagascar? Franco Andreone: Malagasy frogs, as well as all the amphibians around the world, are threatened by a series of factors. 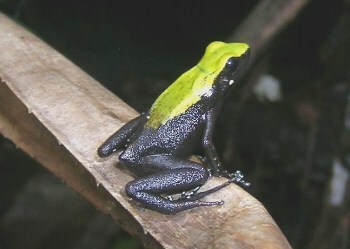 Mantella ebenaui is considered Least Concern. Photo by: Franco Andreone. First of all they are threatened by deforestation and habitat alteration. The ongoing forest cutting process has caused the disappearance or reduction of many important rainforests and dry forests of Madagascar, and the residual forest fragments (that are so important for amphibians) have been heavily modified by human impact. The reduction in forest size and the alteration in their vegetation composition have predictable negative effects that affect the frog diversity in Madagascar as elsewhere in the tropics. The original forest block is now severely fragmented due to deforestation, and this fragmentation has often resulted in high levels of threats among the native amphibian fauna. However, in some cases this loss in amphibian species richness is not immediately evident, because species have differing sensitivities to habitat alterations. Another important aspect of habitat alteration is global warming. Recent studies have confirmed that the mean temperature in Madagascar is rising. Research carried out on the Tsaratanana Massif, which is the highest mountain in Madagascar, showed that many frog species found on the occasion of a first visit were found at a higher altitude ten years later. This change was interpreted as a consequence of increased mean temperature, witnessed by other climatic studies as well. At the same time, researchers analysed amphibians from many other montane massifs, which are also featured by peculiar high altitude endemics. Their analysis also showed that among the 39 montane species (those having a known elevational distribution > 800 m) 18 (or 26 under a more severe scenario) are at risk of extinction with an upslope displacement of 700 meters .What is especially worrying is that this temperature increase would be logically followed by an up-slope displacement of local amphibian populations, following the variation of their climate envelope. Since Madagascar is still under a worrying situation of deforestation and/or forest fragmentation, the total habitat loss will be dramatically followed by species extinction, especially when the species are closely tied and endemic to certain isolated forests. The wonderfully-colored blue-legged mantella (Mantella expectata) is Critically Endangered. Photo by: Franco Andreone. A further important aspect of conservation concern is the collection and harvesting for the pet-trade and human consumption. Some species (e.g. those belonging to Mantella, Scaphiophryne, and Dyscophus) have been highly sought after for the international pet trade due to their biological peculiarities and remarkable coloration. There is still a paucity of reliable data on the impact of trade on wild populations, although in some cases it is evident that collecting represents a confounding threat when the habitat is already compromised and the populations are small. This is the case, for example, for the rare harlequin mantella (Mantella cowani) which was collected in high numbers and survived in a very degraded environment on the high plateau of Madagascar. Fortunately, the collecting and exportation of this species, classified as Critically Endangered, are now banned, a measure that should reinforce its protection. Due to concerns about overharvesting for commercial trade, all frogs in the genus Mantella, as well as the species Scaphiophryne gottlebei are now included on CITES Appendix II. Other species are also of conservation concern, such as the Tomato Frog (Dyscophus antongili) the only native species included on CITES Appendix I. Although its distribution area is wider than formerly believed, the habitat degradation around the town of Maroantsetra, where most known populations occur, is high. There is also evidence that the populations have apparently declined in numbers, and the species appears to have vanished from sites in which it was formerly known. The harvesting for human consumption is also another important threat for Malagasy frogs, notably for those reaching a certain body size, such as several Mantidactylus (M. grandidieri and M. guttulatus), and the large Boophis goudoti. The capture of these frogs, which survive in rather intact forests or in montane habitats, was formerly quite limited, since other protein sources (e.g., chickens, zebus, pigs) were usually available and preferred. Until recently frogs (as well as other animals, such as river crabs and eels) were captured only occasionally. Nowadays, as a consequence of the increasing poverty caused by the recent political crisis, many rural populations were obliged to find alternative foods, and frogs (as well as snails and small mammals) became much more relevant than before in the daily diet. Unluckily, these large frogs have a rather low fecundity, and for this they are not able to recover rapidly after augmented collecting. For this reason there is evidence of population lowering. A calling Boophis ankaratra. This species is considered Least Concern. Photo by: Franco Andreone. Further threats are always related to human impact: the recent construction of pipelines for the exploitation of nickel in the Moramanga region caused the logging and alteration of large sectors of mid-altitude rainforests where some threatened species live (e.g. Mantella aurantiaca). This is well-known for one of the most important habitats of this species, the Torotorofotsy Marsh, where a true “road” built to install the pipelines spoiled wide sectors of the forest. Finally, surprisingly enough the most important threat for Malagasy frog is a still an “inexistent” threat! The lethal chytrid fungus (Batrachochytrium dendrobatidis), present in many parts of the world and cause of incipient extinctions of so many peculiar frog species (e.g. the spray toad Nectophrynoides asperginus in Tanzania and the Mountain Chicken Leptodactylus fallax at Montserrat), has not yet been found in Madagascar, and conservationists are really hoping that this pathogen will not arrive in Madagascar. Unluckily enough the Bd is already reported in many nearby African countries, among them Tanzania, Kenya and Mozambique. The risk is that this fungus could arrive (sooner or later) to Madagascar together with material imported from Africa, through natural spread or with tourists. In fact, it is quite easy to spread the Bd by using dirty boots or shoes that came into contact with mud or water of an infected area elsewhere. This could rather easily happen if tourists are, for example, European and American herpetologists who used the same boots a few days before coming to Madagascar and visited a pond with amphibian populations affected by Bd. The logical way to prevent this spread is trying to delay the Bd’s arrival in Madagascar, and by inviting tourists to follow strict hygiene protocols (e.g. washing boots in disinfectant solutions or simply using brand new material), and not importing any foreign amphibians. Importation of foreign amphibians is not yet known in Madagascar, and should be rigorously checked and limited, since it is well-known that the translocation of foreign amphibians from one country to another is one of the most important ways to spread the chytrid. Mongabay: How do you think the recent logging crisis in Madagascar may be impacting already imperiled frog populations? The climbing mantella Mantella laevigata is classified as Near Threatened. Photo by: Franco Andreone. Franco Andreone: This is difficult to say, since we do not know exactly the extent of deforested areas. As for many other zoological species, the forest cutting and deforestation has an immediate and/or long-term effect on biodiversity. Apparently, most of the recent illegal deforestation actions occurred in some of the most important biodiversity reservoirs, which are the Marojejy Massif and the Masoala Peninsula. These areas were important biodiversity refuges and relevant endemicity centers, as well as among the “wildest” rainforests of Madagascar. Recent studies in these areas showed that there are still many undescribed species, of which we don’t know the distribution. It is not unlikely that some of these species have very narrow extents of occurrence, and thus the logging could have already heavily affected some of these species, possible leading to extinction. Mongabay: What can the general public do to help endangered frogs in Madagascar? Franco Andreone: The most immediate way to help frog conservation in Madagascar is by supporting the ongoing conservation actions promoted by the IUCN Amphibian Specialist Group through its ACSAM Initiative. To achieve this result, it is important for potential donors to contribute funds that will support research on little-known species, or to purchase land and forest fragments to save the last residual populations of frogs. As said before, tourists can contribute to the knowledge of Malagasy frogs (and other herps) by downloading their photographs and observations to the site. Then when they visit Madagascar, they should make a particular attention to the sites they visit, carefully cleaning their boots to avoid spreading the chytrid. Finally, the general public can help by spreading the awareness of this biological richness and joining our Facebook sites Save the Malagasy Frogs and A Conservation Strategy for the Amphibians of Madagascar. The Boophis goudoti is considered Least Concern. Photo by: Franco Andreone. 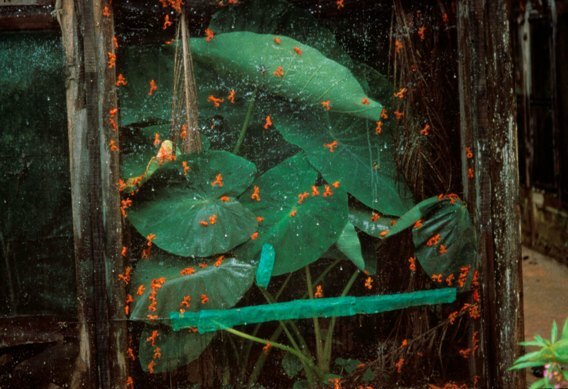 Hundreds of golden frogs Mantella aurantiaca, which are considered Critically Endangered, for export. Photo by: Franco Andreone. The tomato frog Dyscophus antongilii is considered Near Threatened. Photo by: Franco Andreone. The Boophis ankaratra is considered Least Concern. Photo by: Franco Andreone. The Mantidactylus guttulatus is considered Least Concern. Photo by: Franco Andreone. (05/11/2009) Amid the amphibian extinction crisis—where amphibians worldwide are disappearing due to habitat loss, pollution, and a devastating fungal epidemic—the Spanish Scientific Research Council (CSIC) has announced some good news. In a survey of the island-nation of Madagascar they have identified between 129 and 221 new species of frogs. The discovery of so many new species nearly doubles the island’s total number of frogs. (03/23/2009) With its famous diversity of frog species, Madagascar has long been targeted by smugglers for the pet trade. While this threat is relatively well understood, less known is the domestic market for edible frogs. Writing in Tropical Conservation Science, researchers from the University of Aberdeen and institutions in Madagascar provide a glimpse into this activity. (03/11/2008) Madagascar is one of the most unique places on Earth for wildlife. When the public thinks of Madagascar’s fauna most likely they think of one of the fifty species of lemur. Yet, Madagascar possesses a wealth of endemic wildlife outside of these unique prosimians. For example, to frog-lovers Madagascar is a paradise. The only amphibians living on Madagascar are frogs; the island is devoid of toads, salamanders, or newts. But what it lacks in other amphibians it makes up for in the number and beauty of its frogs. Currently, 240 frogs have been catalogued in Madagascar, 99 percent of which are endemic. Yet, amphibian expert Dr. Franco Andreone believes that, according to recent field studies, this may only be half of the frogs that actually live in Madagascar. Dr. Andreone believes the final tally could reach 500 species! (02/18/2008) Researchers have discovered the remains of what may be the largest frog ever to exist.